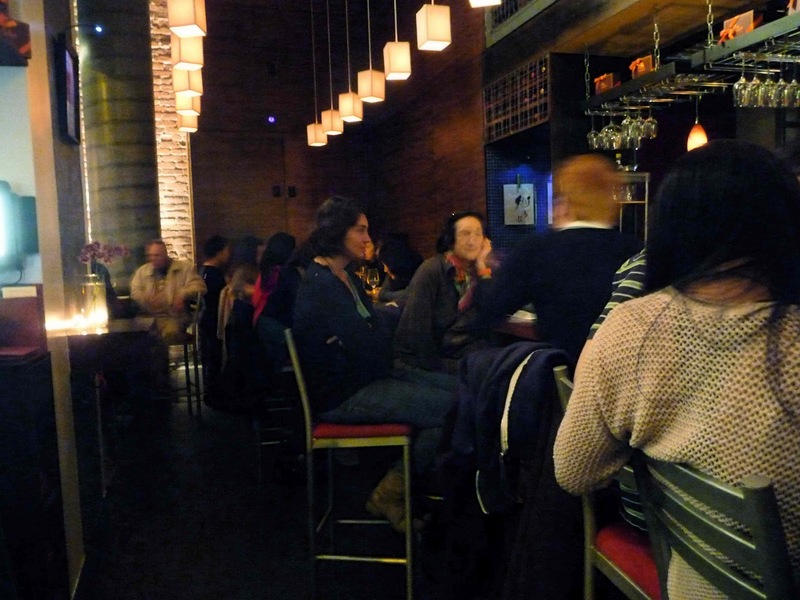 Should you ever be in southern Midtown (or northern Gramercy), perhaps on your way to Penn Station to catch an Amtrak train to the folks back home, and need a hip place for food and drinks, AYZA should be your go-to spot. 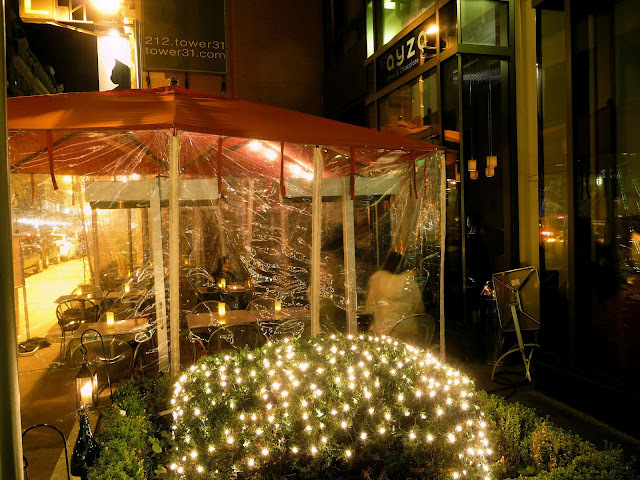 It's half wine bar and half restaurant, very trendy, not terribly expensive, and even on chilly nights you can sit outside under the heatlamps. So this hotspot is where Speeds and I decided to go. 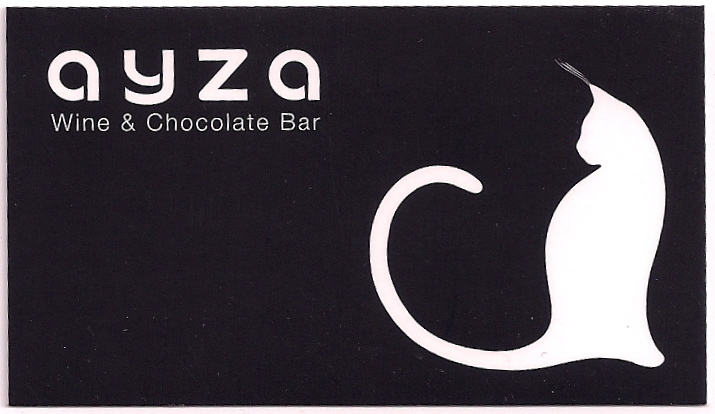 AYZA seems to be on everyone's watch list these days, but people seem taken by the "& Chocolate Bar" part of their name. For a chocolate bar, I can't say that they offered much. Some chocolate martinis (that I regret to say I didn't have), and then a chocolate-centric dessert menu. Basically, the chocolate bar half of the name means that they sell about a dozen varieties of truffles from Martine's and Jacques Torres. At about $3-4 per. But Speeds and I are food people at our core. So we paid most of our attention there. Despite having an appetizer and an entree section, AYZA really is a small plates Mediterranean restaurant. The appetizers are slightly less expensive than the entrees, but not really smaller in size. 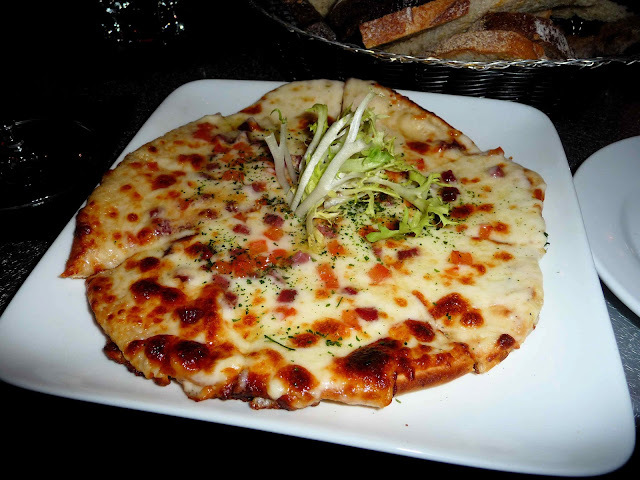 Each dish floated in the $10-20 range. Wine-wise, we each ordered by the glass. Expect to pay about $11. Should you go for a bottle, they range in price from the mid-$30s to $1200, with the average at about $50. With approximately 100 to choose from, the selection is good without being overwhelming. One nice thing: sometimes, a restaurant will put bread on the table while you look over the menu, but AYZA put out little sake glasses of Warm Spiced Wine. The second round of food, while also very good, was less impressive. 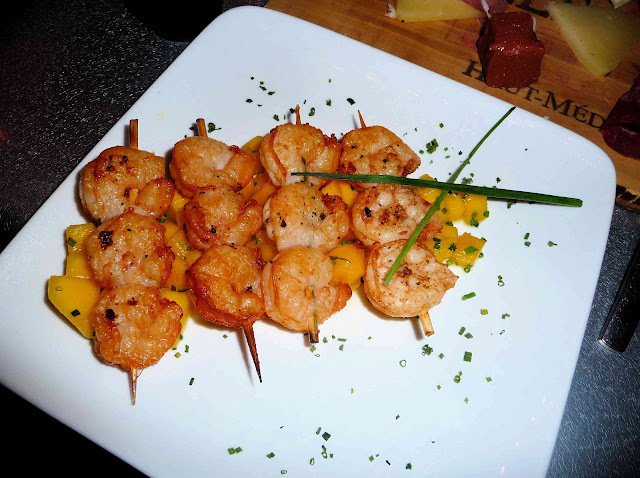 Speeds enjoyed the Grilled Baby Shrimp over a bed of diced mango, but for me, after the pizzette, it was like bringing a knife to a gunfight. That and mango without rum seems heartless. My entree, the Brochette Marinated Chicken, as you can see, is hardly larger than an Speeds' shrimp appetizer. When our server brought it out, I literally almost sent it back thinking it was for a different table. I mean, what's with the steak tartare right there in the middle of the plate? 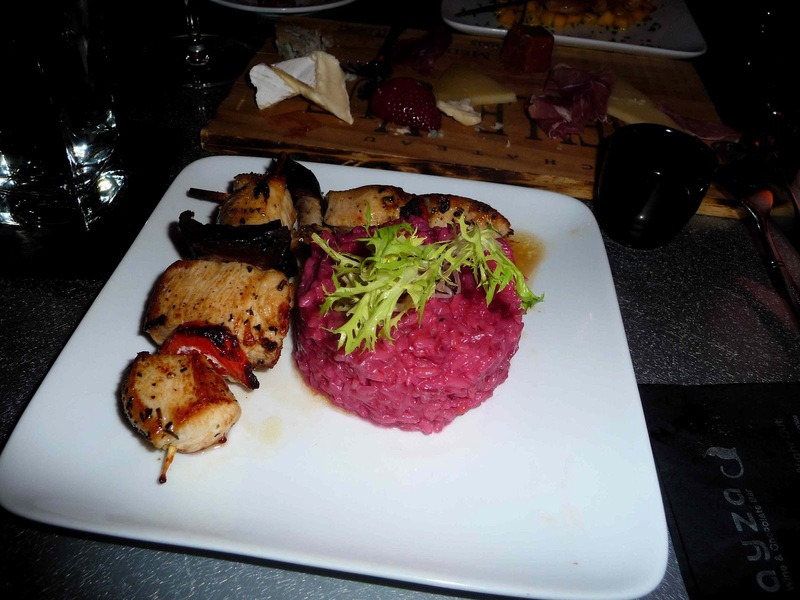 Well, it was mine, and that's not steak tartare, it's a rice dish made with cheese and beets, like a beet risotto. Tangy and certainly interesting, it might not have been my first choice of sides to pair the chicken with. The chicken itself was cubed with pepper and mushroom on a skewer and was very good. Moist, slightly charred, tender. If the street-cart kebab guys could make a skewered chicken like this, I'd be a happy camper. As I said, the chocolate is almost an afterthought at AYZA, despite the name, which seems for for cutesy effect than anything else. Speeds insisted that we try out the chocolate selection, so she chose to try each of the four offered Martine's Chocolates. I won't go through them all, but each one was a small, 1-inch by 1-inch truffle. All were good without being great, but for what they cost they were supposed to be great. The Jacques Torres selection was larger, cheaper, and my experience with Jacques Torres in the past has been a good one. 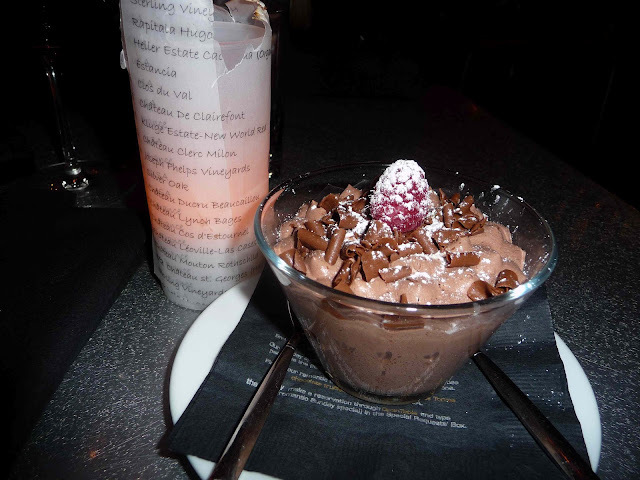 My dessert was the Silky Chocolate Mousse, that Speeds found too sweet and I found just right. I was quite pleased with my decision. Next time, I'll get a coffee with my dessert. Or another wine. Or a chocolate martini. Or all three. Overall, we had a great time. The service was friendly and fast. 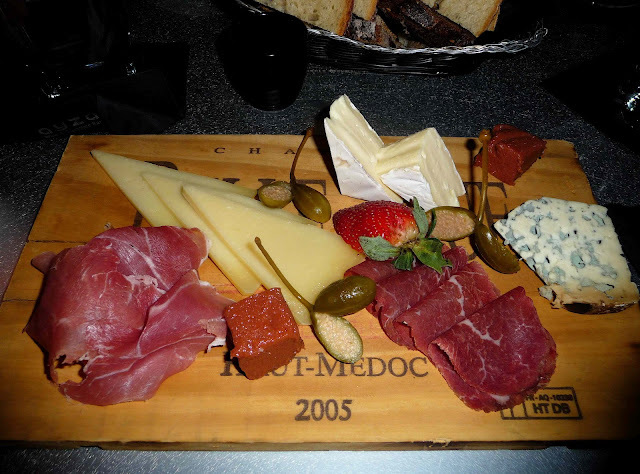 The wine was good, the cheese plate was good, the food was good. While on the expensive side, it's not crazy overpriced (save the chocolate part of the menu). Speeds and I have decided that, with her living in Albany for the time being, and its proximity to Penn, we'll move AYZA into our rotation of places to go regularly. Our meal consisted of four glasses of wine, two appetizers, one cheese/charcuterie plate, one entree, and two desserts. The total came to $158 with tax and tip.